Case studies are an investigation into a tooling issue, the solution chosen, and the results. When a manufacturer has a problem with the performance of a tool set, an investigation into the problem and a possible solution, is begun. Criteria such as; the tool type, work material, production rate, tooling material and problem details are recorded. Under a microscope, an evaluation of the problem area is performed. Questions are asked, such as “Why did this tool fail?”, “Does the microstructure indicate that the tool was properly hardened and tempered?”, ”Does the tool show signs of grinding burn?” and “Is there another tool steel that would perform better than the original material?”. The mode of failure is determined from this investigation. In some cases, another tool steel type is chosen as a solution to the problem. Another tool set is produced from the new tool steel grade, production is run and the results are recorded and evaluated. These case studies serve as a reference to problems that you may observe in your production runs. 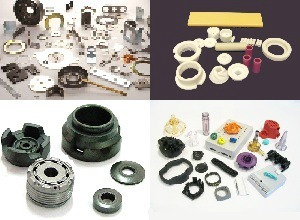 Examine the case studies and see if they may help in solving some of your tooling issues. Our newest case study involves the use of Vanadis 23 in a metal stamping tool set and the solution that was used. See the case study here. We are pleased to present products and services that my benefit you. Are you in need of an easy, affordable method for marking your tools, dies, molds or knives? We have discovered this etching kit that anyone can use to produce permanent etchings on their parts in just a few seconds. Whether you need to mark your logo on a product, or part numbers on your tool sets, this system will produce great-looking, long-lasting results. Comparison Charts are used to compare the properties of similar steel grades. 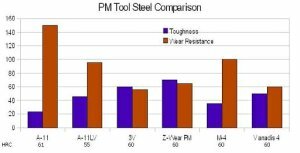 These charts are used to compare the toughness, wear resistance and hardness of each tool steel grade. High-speed steel comparison charts also depict the red hardness of each grade, as this is an important property of cutting tools. Stainless tool steel comparison charts also depict the relative corrosion resistance which is important in many plastic molding and food processing operations. These comparison charts compare one industry standard grade with similar grades used in the same industry. Cold work tool steels such as D-2, would be compared to other cold work tool steel grades. Hence, a grade such as A-2 would not be compared to 440C. The toughness of one grade is compared to the toughness of another grade and a relative number is used as a reference. The comparison is more important than the reference number. The hardness of the tool steel grades will produce different wear resistance and toughness numbers, so grades should be compared at similar hardnesses. You can access all of our comparison charts here. At simplytoolsteel, we keep you up to date on the latest events and news in the tool steel industry. Last week, Carpenter Technology announced that they intend to sell Latrobe Specialty Steel Distribution and Aceros Fortuna. You can read our full report here. Whether you are a part producer, tool maker or distributor, getting your advertisement in front of your customer is important to the success of your business. At simplytoolsteel.com, we bring together like-minded, creative individuals that have tool steel as a common interest. We are now offering affordable advertising space to allow you to connect with our audience. During this month, we are now offering a 2-for-1 advertising special. Buy 1 ad display and receive a second ad display for free. Simply go to our advertising page , fill out our Ad Form and indicate on which pages that you would like your ad displayed. Sign up now and have your ad displayed on our site for as little as $13.20 per month. We hope that you have found this issue of Simply Tool Steel News to be very beneficial. We are already looking forward to the next issue. Only one month to go. Until then, please consider adding www.simplytoolsteel.com to your list of favorites.